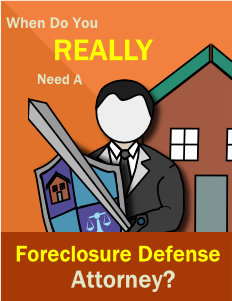 ﻿ When Do I Need a Foreclosure Defense Attorney? Someone needs to be there (Either you or your attorney) to find and expose errors in the foreclosure party’s paperwork and evidence. Even if the lender executed everything perfectly an attorney can still buy you more time in your home. 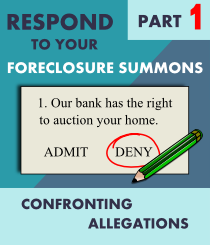 If nobody is there to represent your side the court will most likely take the documents the foreclosing party provides as evidence and support the foreclosure. Loan Modification while property is in foreclosure. 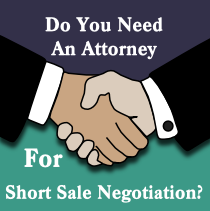 An attorney will buy you time and give you leverage to negotiate a loan mod with the lender. Loan Reinstatement while property is in foreclosure. An attorney will keep the bank at bay which gives you enough time to negotiate reinstating your loan with the lender. Short Sale while property is in foreclosure. An attorney will drag the case out giving you the time and to find a potential home buyer. After a few months lender’s are usually more open to negotiating deficiency waivers. Deed in Lieu while property is in foreclosure. 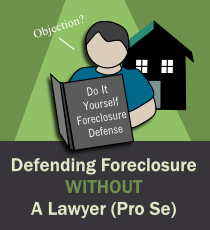 A good attorney will threaten to drag the foreclosure out for months and years. After a few months of going nowhere, lenders often agree to write off the debt with a deficiency waiver if the home sells for less than what you owed. 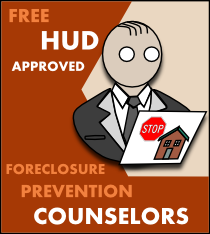 Loan Modification while property is NOT in foreclosure. You should begin negotiating with your bank well before they file a foreclosure lawsuit against you. Loan Reinstatement while property is in NOT in foreclosure. You can see what the bank will require to get your mortgage back on track. 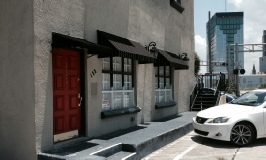 Short Sale while the property is NOT in foreclosure. You will need to find a buyer and get the lender’s approved for the sale, AND get a deficiency waiver in writing prior to the sale. Deed in Lieu the while the property is NOT in foreclosure. You will need to get permission from the bank and get a deficiency waiver in writing to protect you if the home is sold for less than what you owed on it. To Summarize: If your property is in foreclosure (If you have been served), you are always better off with an attorney. Otherwise you are most likely going to lose your home and be stuck with a enormous amount of debt. 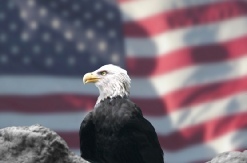 When you have been served a foreclosure summons in Florida, the last thing you have is time. (Only 20 days to respond and not doing so will result in a default judgement) If your goal is to keep the home then you need to work out a loan modification with the bank. Why would the bank bother doing that if they know they will be able to sell the home in a few months if you don’t respond to the foreclosure summons? They will simply deny your loan mod or never get a chance to “review” your loan mod request. Having an attorney represent you gives you an upper hand when requesting a loan mod. It’s simple: You Have Trapped Their Investment Money. Think about the goal of the lender. They front you a large amount of cash (often over $100,000) with the agreement that they will eventually get their money back plus a return on their investment through interest. When you pay your mortgage each month the loan is referred to by the lender as a “performing loan” as in it is making the lender money. 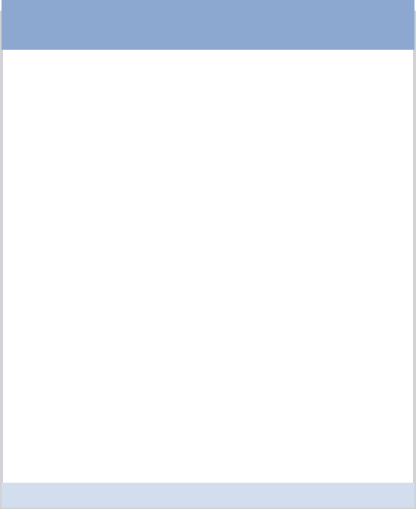 When payments are missed the loan becomes a “non performing loan” meaning it is not making the lender any money. It also ties up their large amount of initial investment money. Usually a lender will wait until the borrower misses 3 payments before initiating the foreclosure process. Even if you don’t fight and everything goes smoothly for the foreclosing party, it is usually a minimum of 90 days before the home can be sold at auction. From the time the first payment is missed, through the foreclosure process, and up until the home is sold the loan remained “non performing.” That is a minimum of 6 months of the lender is not making any money from the loan. The money that lender invested in the home is stuck until the property is sold or an agreement is worked out with the original borrower. So what happens when you hire an attorney? Read on. To Summarize: Hiring an attorney is kind of the legal equivalent of getting your big brother involved. There are some cases were the home will have equity, meaning the value of the home has gone up since it was purchased. When the home goes up for auction it may actually sell for more than what the borrower owed on it. If this is the case the extra money should go to the homeowner only AFTER any other liens and fees are taken care of. We are only bringing this up because of the toy car example that was used above. What if the friend who lent you the money manage to sell the car for $30.00 on EBay instead of $18.00 because it was a limited edition? Your friend would then owe you $16.00 because you had equity in the toy car. You already paid back $10.00 and there was a surplus of $6.00 from when the toy car was sold. 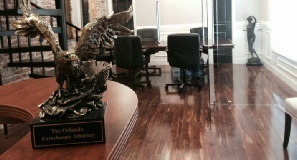 When a foreclosure defense attorney fights on your behalf, they become a serious pain for the lender. Some skilled attorneys have been able to keep homes out of foreclosure for over 5 years and there have been cases where full ownership of the home is awarded to the borrower. This is a serious risk to the lender. Not only are they no longer making money from their investment, there is a possibility they could lose the initial investment in court. The goal of the foreclosing party is to free up their initial investment money so they can use it to invest in something else. A foreclosure attorney makes it incredibly difficult for the lender to recoup their initial investment. Image your friend loans you $20.00 to buy a toy car. You sign and IOU note agreeing to pay him back $2.00 a day for 12 days. You know you can pay this because your parents give you $3.00 a day to buy lunch at school. He writes on the note if you stop paying, he will take the toy car and sell it on EBay to get his money back. If everything goes according to plan, he will make back his $20.00 and profit $4.00 after 12 days. After 5 days of making $2.00 payments you are caught skipping school. Your parents ground you and stop giving you lunch money for a month. (You have to bring a lunch to school) Instead of trying to work out a deal with your friend you avoid him for a week. The next time he sees you he takes back the toy car. After a week on EBay, your friend manages to only gets $18.00 for it. He keep the $10.00 you already paid him and $14.00 of the $18.00 that it sold for. Since your friend is fully paid back with interest he gives you back $4.00. Lets back up to before your friend even repossess your toy car and see what happens when your big brother gets involved. Your brother starts asking questions before your friend tries to take the toy car. Your big brother demands to know more about the loan and if your friend is really the person you owe money to. He asks for your friend to find the original sales receipt for the toy car and IOU note that you signed when loaned you the original $20.00. Your big brother threatens to hides the toy car for months until your friend can prove the money is owed to him. This is really annoys your friend because he just want his money back. After a month of arguing with your big brother, your friend finally agrees to let you pay $1 a day for another 14 days and you can keep your toy car. What Happens If the Home is Sold for More Than What Was Owed?